At Hercules, we use aluminum for our louvers. Why did we opt for that material though? Louvers, or the slotted fences that you may see surrounding commercial properties, can offer big benefits. They’re capable of allowing light or air to come through but keep away things like dirt or debris, or even trespassers who shouldn’t have access. It’s clear that there are a number of reasons to invest in louvers—there are many facilities who can take advantage of the unique attributes of louvers—but one thing that can impact how useful they are is the material they are made of. At Hercules, our louvers are 100% aluminum. Read on to find out just why we made that choice. Because louvers are outdoor structures, it’s important that they are made of materials that can withstand those conditions. Something like wind, rain, or snow can have big impacts on outdoor structures so finding the right way to prevent such issues is important. Aluminum is one of the best materials for handling extreme weather conditions out there. It’s rust resistant and won’t fade over the years from sunlight, meaning there is almost no maintenance whatsoever. Maintenance free options are ideal for anyone who wants to focus on what’s important. Are you trying your best to go green? All of those little daily things like turning lights off or carpooling can be difficult to commit to, but something that is easy to do is one-time decisions like what building materials to use. There are many concerns about building materials and their impact on the environment, but aluminum is incredibly eco-friendly and can do some good for the planet. Thanks to the fact that the material is completely recyclable, your louver won’t ever end up in a landfill and you won’t need to worry about needlessly replacing your louvers more often than you’d like. 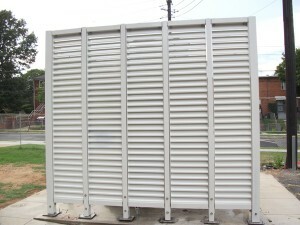 There are a number of creative applications where louvers can be utilized. One common route is using louvers to protect generators, thanks to their ability to regulate air flow but keep away any debris that might impact performance. Another possibility is improving your security. Regardless, aluminum is a flexible material that can be customized to fit your specific needs. No matter what kind of terrain you’re working with, a louver installer can make sure you receive a solution that is right for you. This entry was posted on Friday, March 15th, 2019	at 2:05 pm	. You can follow any responses to this entry through the RSS 2.0 feed. Both comments and pings are currently closed.